MV Sport Pro-Weave Hooded Sweatshirt. 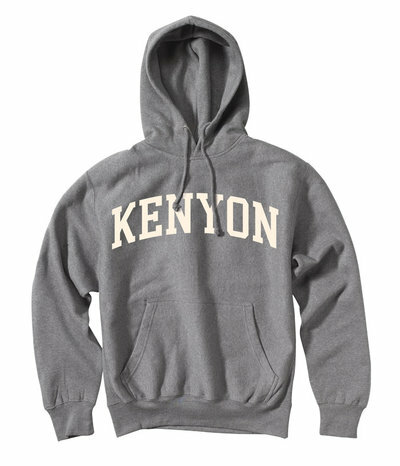 Graphite with Ivory screenprinted "KENYON"
11oz, 80% cotton/20% polyester fleece, side knit gussets, pouch pocket, double layered drawstring hood and knit cuffs/waistband. The herringbone pattern gives this performance fabric a dressed up feel. We love the versatility of this piece! This cozy women's hooded sweatshirt has a classic, vintage feel to the logo stitching, but modern details along the neckline and cropped length. We recommend ordering a size up! This Champion hooded sweatshirt has classic feel with modern performance fabric and a cozy fleece lining. 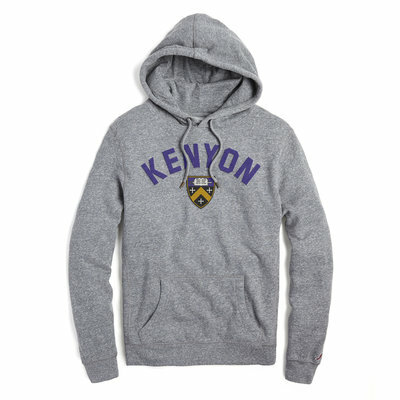 This high quality Nike fleece has classic Kenyon style! Our Eco Pullover is made with super soft organic cotton and a unique Ohio graphic. We are excited about carrying this piece! You'll want to sleep in this one! Our Middle Path sweatshirt is based on a vintage Kenyon piece from years gone by. We love it and so will YOU!